Mix the meat, salt, pepper, mustard and onion in a large bowl. 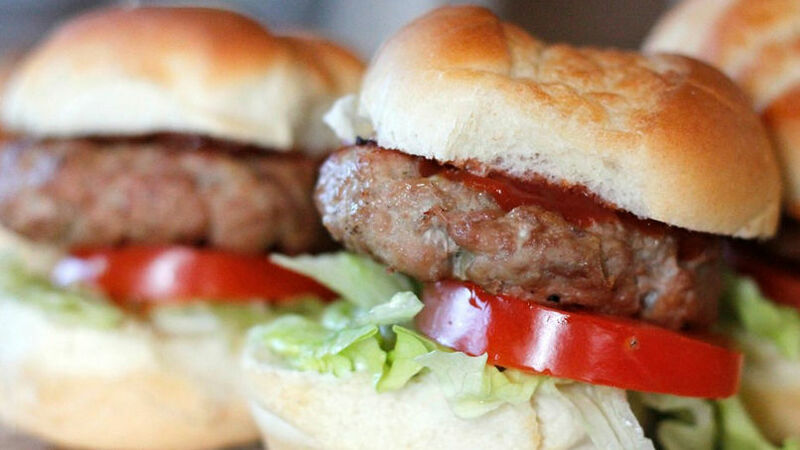 Create 8 mini burgers then bake for 20-25 minutes or until the meat is cooked completely. Flip half way through the cooking time. Place the rolls in a baking dish and bake for 5-6 minutes until they’re browned. Cut them in half, and then add mayo, ketchup, lettuce, tomato and the burger. Serve immediately. Have cheese at hand in case a child or guest wants to add cheese to their burger. You can add carrots or grated zucchini to the meat; it will make it juicier and you’ll add more vegetables to the menu. Memorial day is just around the corner and for many of us this means family get-togethers. It always makes me very happy to see families spend time in their backyards to celebrate with neighbors and loved ones. Planning the menu is very important, it’s also important to think about the kids of the house. It’s always a good idea to have chopped fruits and a pasta salad, but as mothers we’re always thinking of what type of meat our kids will eat without a problem. In my experience, burgers are always a great success. However, I’ve noticed that regular burgers are just too big for kids, so I thought preparing mini burgers might be a better idea. Turkey meat and honey mustard made a great combination. I’m sure kids and adults will love it!